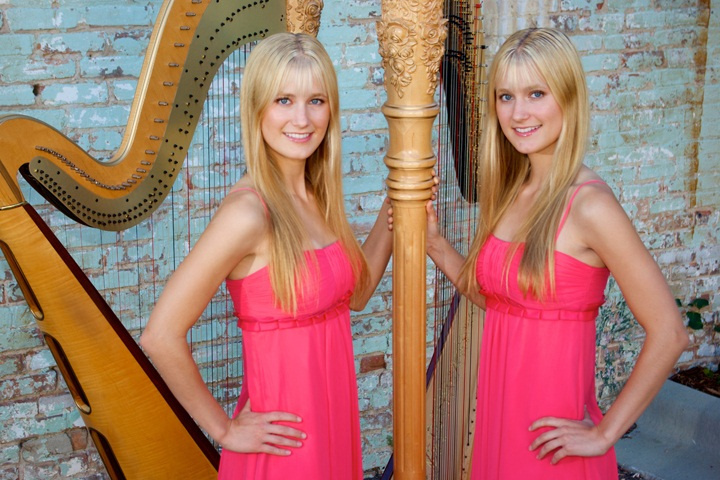 The internet is full of unusual covers of Nintendo songs, but none caught our eye quite like this Ballad of the Goddess harp duet by identical twins Camille and Kennerly, aka The Harp Twins. We talked to the musical duo about gaming, music and sticking together. Nintendo Life: Hi guys, thanks for agreeing to this interview! First of all, please tell us a little about yourselves. Camille and Kennerly: Well first of all, this is the first interview we have agreed to for a gaming site, so thank you for having us! We are professional duet harpists and actresses. 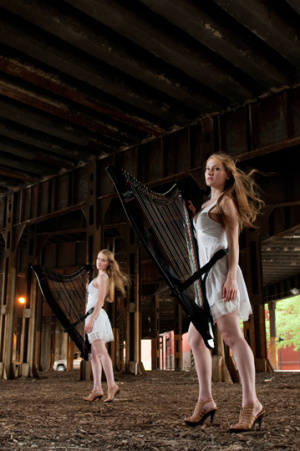 We perform internationally as a harp duo on both acoustic and electric harps. We’re trained classically with degrees in harp performance, but playing rock, pop, and contemporary music is our true musical passion. Since we can’t find harp duets of the type of music we like to play we arrange all of our own music! NL: How long have you been playing music and when did you turn professional? C&K: We started playing piano when we were children. We began harp after we’d been playing piano for about 6 years and immediately fell in love with the instrument. We decided to attend a Conservatory of Music for our University (college) majoring in harp performance. We began to perform professionally while we were in college (university) even though it was quite hectic with our Conservatory studies! Did we mention they dress up? NL: Why did you choose the harp over other instruments? C&K: We were always drawn to the harp. It seemed like a sort of magical instrument to us. Convincing our parents to let us study harp was the difficult part! Our first harp was shared between us and “pre-owned.” But we wanted to play together and not just “share” so we managed to get a second harp. NL: Your website mentions you're “the world's only known identical twin professional harpists” — quite an accolade! How important is it that you perform together? Do you ever do solo work or do you strictly come as a pair? C&K: Thank you so much! We absolutely love playing harp together as a duo. We knew immediately after starting harp lessons that we wanted to play duets. The majority of the music we were assigned while studying harp was solo music, but we spent our spare time arranging and playing duets! We felt most alive and inspired when we were playing together. 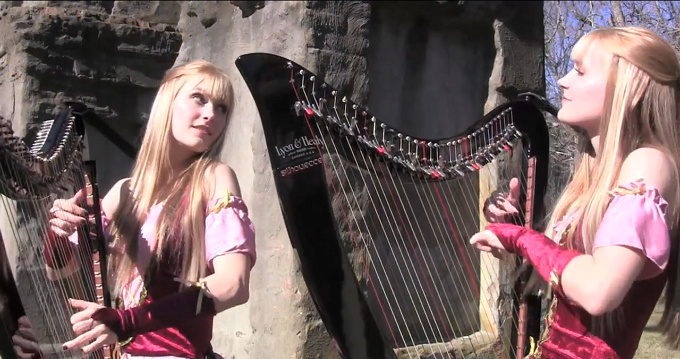 We now arrange all of our own music for harp duet and perform exclusively as a duo. Harp is our musical passion and being able to make music with our best friend is an amazing blessing! NL: As well as harp covers of pop and rock songs you've also covered Ballad of the Goddess from The Legend of Zelda: Skyward Sword. Why did you choose this piece out of all the Zelda music? C&K: Like the whole Zelda series, Skyward Sword has epic music! We found it so inspiring that Zelda SS utilizes a harp as its magical instrument! When we heard “Ballad of the Goddess” for the first time, we fell in love with the stunning melodic line! It is always challenging to arrange an orchestral piece for only two harps, especially without using a backtrack to fill in around us, but we were up for the challenge! NL: Are you big gamers in your spare time? What are some of your favourite gaming series? C&K: We have to admit that unfortunately our rehearsal, performance, and travel schedule doesn’t allow us time for much gaming. However, we are HUGE fans of video game music! We love that gaming music rivals movie soundtracks! There are so many gaming series that have amazing scores! Often we will have songs from gaming soundtracks (Zelda: SS and Final Fantasy VII are two of our current favourites) on repeat while we are working on business! NL: When you play games together, who normally wins? Do you both play fair or is one of you a “win at all costs” kind of girl? C&K: We pretty much universally have the same skill level in anything we attempt! However, playing against each other always seems counterintuitive since we’re inherently a “team”. We would almost prefer that the other did better than ourselves! But rather than hold back we always spur each other on in everything we do. NL: What Nintendo gaming memories do you have from growing up together? ... and smaller, "mini harps"
C&K: We were more the playing-with-Barbie type girls! NL: Which other gaming songs do you have plans to perform? C&K: We have arranged several songs from other video games! We are currently working on videos for those, but we are keeping the song choices a surprise! NL: How can our readers find out more about you? C&K: Nintendo Life readers can visit our website! NL: Do you have a special message for our readers? C&K: We want to say a special THANK YOU to the gaming community for all the love and wonderful feedback! 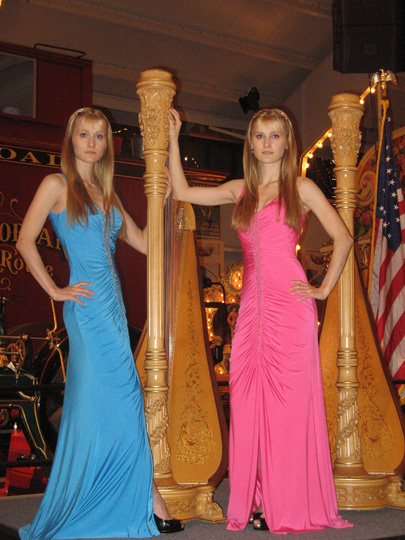 You have inspired and encouraged us to keep doing what we love – arrange and perform on our “magic” harps. For those of you who enjoyed our Zelda arrangement, we have 31 videos on our YouTube channel. We would also love to connect with Nintendo Life readers on our Facebook and Twitter! Visit any time for behind the scenes, sneak peeks, and bonuses! Unfortunately, YouTube does not allow us to respond to all the mail we receive. However, if you write or post to us at either Facebook or Twitter we will respond! Camille and Kennerly also recorded a cheeky message just for you lucky Nintendo Life readers! Thanks to Camille and Kennerly for their time. I never heard of them before, but I'm glad i have now. When your interviewees have an enthusiastic way of speaking in general, there's no need to keep using so many exclamation marks. It makes it read a bit strangely when nearly every sentence is marked with that punctuation. never heard of them but its nice to know now! @warioswoods: Yeah, I noticed that, too. It made me believe each exclamation was made by a different twin... Like in movies. O_O I'd love to have them play me music. I think I'm in love... twice. That rumbling sound you hear is the thundering of the next 100 comment authors dashing to their keyboards to type something lewd. They're purdy, and I love the harp. This is chocolate mixed with peanut butter right here... doubled! Lovely! But im not too keen on the rockstar style axe-wielding pose. Just sit yourselves down girls and let the music do the talking. They are both very talented at both arranging and playing that music and I like their outfits too. Oh... so you do use frequent exclamation points in your own writing, not just your speaking. I stand corrected. But I still intend to find a clever way to blame James. This is the first time that a girl has ever talked to me! Well, two girls, and they were talking to everyone on Nintendo life and not just me, but still! Tsk! James called them "guys". Thanks for the interview. You two are lovely and have amazing musical talents. I've got a deep musical background and performance experience myself and I know how challenging it is just to play the harp, but writing your own arrangements at this level is extremely difficult and all the more impressive. If y'all ever make it to my part of the States, I'll definitely enjoy getting the chance to see you two perform. Great job girls, I really enjoyed that, especially the one from Guns and Roses. Glad to see that there are still some harpists, especially when they can also take on modern songs. The Harp is one of the most difficult instruments to master and I was beginning to think it was a lost art. Hope you guys go far. I've subscribed to their YouTube channel. Thanks, Nintendo Life. Learn about something new every day. yeah, good job guys with the limit on crude comments! Very nice arrangements! Kinda weird but good for them, they seem happy and good at what they do! Doesn't my punctuation seem really tasteful!!? No?! Why not! I wonder which twin is the evil one? I liked the performance and I was really impressed with the arrangment. I didn't liked the video though. The ruins are cool and the twins are very pretty but the director could do better with such good elements. Very cool indeed. Very purty and talented duo there. Good work. They need to tone down the exclamation points - almost every sentence ended with one, hah. Lovely girls and lovely music, though. Yeah girls, don't be so enthusiastic and happy about stuff. These pretty ladies remind me so much of Zelda in Skyward Sword. @James I know, curse those with an optimistic view of the world, what are they thinking? Regardless of that, as a former musician (I've not played the French Horn in a few years now), these guys deserve a lot of respect for what they've achieved so far. They also happened to choose one of the finest video game themes ever conceived, in my humble opinion. @Monteblanco Thank you for watching. We are happy to hear that you enjoyed our arrangement, performance, and location! There is no director, though, or any other crew for that matter. All of our videos are completely self-made. We arrange the music for harp duet, record the audio ourselves at home, scout our locations, pick our own wardrobe, and edit all of our videos ourselves. The only exception is that we have a family member "man" our little hand-held camera - which is usually on a tripod. I've watched all the videos on YouTube now and I'm really amazed by how well the audio and video are synced. It looks like the audio was recorded live. Its more a publicity stunt. But they are cute.They seem sincere enough so best of luck to them. These girls deserve their own video game. @HarpTwins Speaking of locations, where was that video filmed? I'm guessing somewhere in the US, but those Roman-style columns look like something out of Europe.